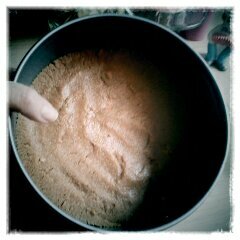 Put the mixture on the bottom of your baking mould ; press firmly with your hands - it should cover a 20 to 22 cm mould. To lift and remove the cake easily, cut a circle matching the size of your mould's bottom out of baking paper. Make a firm cup of coffee and add 20 dl Amaretto to it ; leave it gently to boil and keep it aside. Soak 6 sheets of gelatin in cold water. After 5 minutes, drain and squeeze them gently and add to the coffee/Amaretto mix. Take a small plate and pour some Amaretto in it : dip boudoir cookies - cut in half - into the Amaretto with the non-sugary side of the cookies. Put each piece of boudoir straight up on the side of the mould, the sugary side facing the outside. Leave it to rest in your fridge. 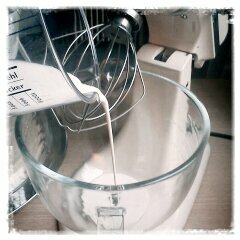 Pour 25 dl of cream together with 125g of crystallized sugar and whip on a low level until the cream is smooth and lush. 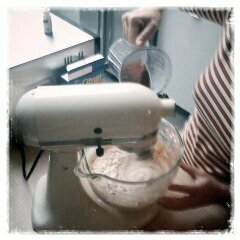 Add 500g of mascarpone ; fold gently (or on a low Kitchen Aid level) into the whipped cream. 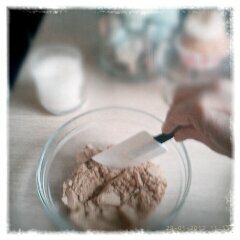 Pour the coffee/Amaretto mix gently in your cream/mascarpone mix. 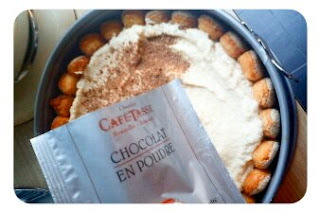 Take the base of your cake out of the fridge and put half of this mixture in the mould. Add some leftover boudoir crumbles. Add the last half of the mascarpone mix in your mould. Finish off with chocolate/cocoa powder ; don't be thrifty ... you may sprinkle a lot on top of your lushious tiramisu cake ..
You forgot the last step: Now apply the cake directly to your hips.